Tomorrow would have been Lucille Ball’s 100th birthday. Though she starred on Broadway, in films and in several other sitcoms, she’ll always be remembered by most of us as Lucy Ricardo, the red-headed housewife who was dying to get into show business. 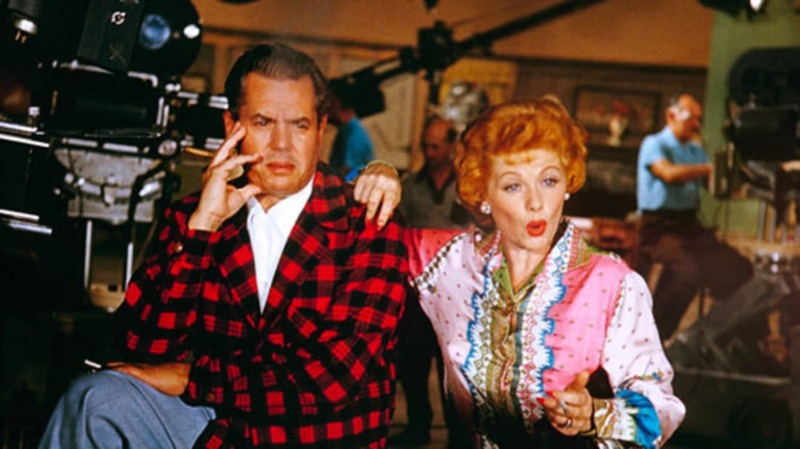 In honor of Lucy’s centenary, we share a few behind-the-scenes tidbits from the I Love Lucy set. “Job Switching” (often referred to as “The Candy Factory Episode”) has long been a fan favorite, particularly the scene where Lucy and Ethel are stuffing their faces and clothing with chocolates while trying to keep up with a speedy conveyor belt. The previous scene featured Lucy hand-dipping chocolates with a real-life dipper that Desi Arnaz had spotted working at the Farmer’s Market on Fairfax Avenue. Amanda Milligan had never seen I Love Lucy (she watched wrestling on Monday nights) but Desi hired her anyway: he thought her deadpan expression would make her a perfect “straight woman” for Lucille to react to. During rehearsals, Lucille was worried that the scene just wasn’t going to be funny on film because Milligan seemed hesitant to hit her in the face as the script specified. When the cameras were rolling, however, Milligan hauled off and smacked Lucille so hard that Ball feared her nose had been broken. Despite her pain and ringing ears, Ball didn’t call for a “cut”—she didn't want to have to do another take! I Love Lucy almost never made it to the air because CBS had trouble securing a sponsor for the show. Finally, tobacco giant Philip Morris signed on at the 11th hour. As a result, lots of smoking was featured in each episode, and the name “Philip Morris” was worked into the dialog whenever plausible. There was, however, one small problem—when it came to rich tobacco flavor, Lucille Ball was a Chesterfield girl. She eventually overcame this little hurdle by having a stagehand stuff any on-camera Philip Morris packs full of Chesterfield cigarettes. Do You Pop Out at Parties? Are You Unpoopular? Another fan favorite was, interestingly, not one of Lucille Ball’s favorite episodes. It wasn’t until “Lucy Does a TV Commercial” was voted tops in many viewer polls over the years that she acknowledged that it was a funny episode. During filming, she was too nervous and worried about messing up her lines (imagine having to say “Vitameatavegamin” that many times during a spiel) to appreciate the humor. Lucille Ball was many things, including a great physical comedienne, but one thing she was not was an improviser or extemporaneous speaker. Every slurred word of her drunken Vitameatavegamin pitch was written in the script. Lucille even came up with a back-up plan lest she forget her lines: she had script clerk Maury Thompson made-up and placed off-side in front of her podium holding up her lines (there were no cue cards on the I Love Lucy set) much like a real commercial setting. By the way, that stuff Lucille was pouring onto the spoon was apple pectin. A “life imitates art” by the way: that “pick-me-up” tonic for the aging called Geritol contains 12% alcohol. “Lucy’s Italian Movie” faced a variety of obstacles….first was getting a vineyard to donate the necessary grapes for stomping. The company that ultimately agreed did so with the proviso that it must be mentioned in the script that foot-pressing was an outmoded method of making wine in Italy. Next was the local extra cast to wrestle Lucille in the grape vat; Teresa Tirelli didn’t speak any English and an interpreter had to explain the scene to her. Apparently something was lost in the translation because Tirelli didn’t grasp that this was supposed to be a filmed-from-the-waist-up fake fight and she literally held Lucille’s head under the grape mush until the star nearly drowned. And lastly, even though the show was broadcast in black and white, Lucille, Desi and the production staff were sticklers for detail, so a formula for a purplish/blue dye had to be worked out that would properly tint Lucille’s flesh and hair without irritating her skin or reacting with the chemicals used to keep her permed locks that famous henna color for that final scene. In the end, this was one of the few instances where the scene was re-shot several times after the studio audience had left and was later pieced together by film editor Dann Cahn. George Reeves, TV’s Superman, guest-starred on an episode of I Love Lucy but was not acknowledged in the closing credits. On a show where everyone from the walk-on waiters with one line were credited, why wouldn’t a bona fide TV star like Reeves be given his due? The answer was that Lucille had two youngsters at home who believed in the superheroes that they saw on television like Superman, and she didn’t want to disillusion any of the younger fans who watched her show. Share your Lucy love! What is your favorite episode? What blooper have you noticed that slipped past the editors? I Love Lucy fans want to know. LIFE.com is featuring a gallery of previously unpublished Lucille Ball photos. Check it out here!